Heads up, forex friends! The U.S. will be releasing its retail sales report this Thursday at 1:30 pm GMT, so buckle up because there’s a good chance that the Greenback may be getting a volatility injection. And if you need a quick review of what happened last time, as well as a preview of what’s expected this time, then this write-up is just for you. The headline reading for the total value of retail sales in September only printed another measly 0.1% month-on-month increase, which is way off from the expected 0.7% increase. The core reading, meanwhile, printed a 0.1% contraction, which is very disappointing since the consensus was for a stronger 0.4% increase (+0.2% previous). And looking at the details of the retail sales report, only 5 of the 13 major retail store types reported weaker readings compared to August, while the rest printed stronger readings, so the weakness wasn’t really broad-based. However, the 1.8% slump in sales from food and drinking places (+0.3% previous) took a heavy toll on overall retail sales, which is why the headline retail sales reading only printed a 0.1% increase while the core reading was negative. In short, the September retail sales report was a disappointment on the surface. However, the details of the report removed some of the disappointment since 8 of the 13 retail store types actually printed growth. Both the headline and core readings did disappoint, however, so the Greenback got slapped broadly lower in a knee-jerk reaction. But since the details weren’t too bad, follow-through selling was limited and buyers began fighting back, causing the Greenback’s price action to become more mixed. 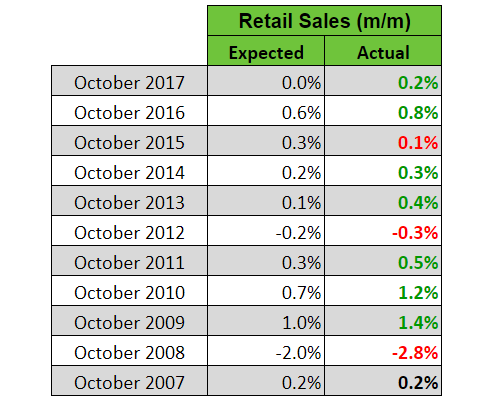 For the retail sales situation in October, the general consensus among economists is that the headline value of retail sales will print a 0.6% month-on-month increase while the core reading is expected to rebound by coming in at +0.5%. There’s therefore a consensus that retail sales was stronger in October. And since the core reading is expected to recover substantially but the headline reading is only expected to print a slightly stronger reading compared to the core reading, there’s therefore also an implied consensus that non-vehicle sales will drive the recovery in retail sales. After all, vehicles sales are excluded from the core reading. So, what do the available leading indicators have to say? Looking at some of the available leading indicators, total vehicle sales in October climbed by an annualized rate of 17.6 million, which is slightly more than the 17.4 million printed in September. Markit’s October manufacturing PMI report noted that “The upturn in new orders accelerated to a five-month high and was widely attributed to greater client demand across the domestic market.” Perhaps that will translate to stronger retail sales. Moving on, the October NFP report showed that the retail trade industry added 2.4K jobs. Wages also continue to grow and 250K non-farm jobs were created in October, which may translate to higher spending. Comparing retail sales growth between October and September, there are more instances of weaker readings for both headline and core retail sales in October. However, that historical tendency has weakened recently since there are more instances of stronger headline and core October readings in the last five years. Economists also apparently have a strong tendency to undershoot their guesstimates for the headline reading since there are lopsidedly more upside surprises over the years. The core reading is another story, though, since there are more downside surprises. However, there have been more upside surprises in more recent years. In summary, the available leading indicators appear to be hinting at stronger retail sales growth in October, which is in-line with the consensus view. Historical data doesn’t really back the consensus view, nor the leading indicators, since the headline and core readings for October are usually weaker compared to September. However, it’s worth highlighting that there are more instances where the October reading has been stronger in recent years, so historical trends may be changing in favor of stronger readings for October. With that said, economists apparently have a strong tendency to undershoot their guesstimates for the headline reading since there are more upside surprises over that years. And that skews probability more towards an upside surprise for the headline reading. Anyhow, just keep in mind that I’m talking about probabilities here, so there is always a chance that the headline reading may surprise to the downside instead. As for the core reading, that’s more of a mixed bag, but there have been more upside surprises in recent years. At any rate, just keep in mind that if both readings miss expectations, then that usually (but not always) triggers a quick Greenback sell-off. On the flip side a quick rally is usually triggered if both readings are better-than-expected. And if the readings come in mixed, then the Greenback’s knee-jerk reaction usually depends on the headline reading. Also, do keep in mind that if news trading ain’t your thing or if high volatility makes you uncomfortable, then you can always just opt to sit on the sidelines and wait for things to settle down.